Miss Gonzalez is an International Board Certified Lactation Consultant. She has a 10-year background in pharmacy before she found her calling upon the birth of her son. As a single mom and working full time she was determined to pursue a career in lactation. After she obtained her training in California and became a Certified Lactation Counselor, she became Miami Children’s Hospital’s first lactation consultant student/intern while providing pharmacy care full time for patients throughout the hospital. Upon her completion of clinical experience treating an array of breastfeeding difficulties hospital wide and passing the International Board of Lactation Consultant Examiners exam, she earned her International Board Certified Lactation Consultant designation. Shortly after, she was offered the position of Lactation Specialist at Miami Children’s Hospital. She oversaw lactation management throughout the organization to provide utmost care for her patients by protecting, supporting, and promoting breastfeeding. In 2015, she ventured into private practice. Mrs. Gonzalez joined our Body Belly Baby Team in 2016 and delivers excellent services to our mommy community. I was referred to Body Belly Baby early on in my pregnancy, and I attended the pre-natal Pilates classes weekly up until the very end. From the beginning I absolutely loved the studio and the personalized attention from the owner, Valerie. She went above and beyond for all the students, and always answered all of our many pregnancy questions with helpful tips and solutions, in addition to the physical Pilates instruction. I had a dream pregnancy, no sickness or discomfort, and barely any water retention, and I truly credit my Pilates practice with Valerie for my prenatal health. My strength grew every week, and I just felt better after every class, no matter how tired I was before. I had tried prenatal yoga before finding the studio, but I found that I enjoyed the Pilates classes so much more, since they are tailor-made to build the strength necessary for labor, and not just stretching exercises to relax. So often pregnant women are told to rest and cease physical activity, but I found that I felt healthier and stronger the more active that I was. The classes at Body Belly Baby also provided great camaraderie with other pregnant students; I really enjoyed bonding with everyone and hearing about their unique pregnancy journeys. In addition, the pediatric CPR course offered at Body Belly Baby was excellent, and both my husband and I attended. 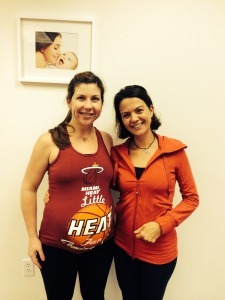 I look forward to taking the baby massage courses and to continuing with my Pilates practice postpartum. I would recommend Body Belly Baby highly to any expectant or new mother, and I am so thankful that I found the studio as soon as I became pregnant! Valerie is so caring and encouraging- she provides that TLC that all pregnant women so desperately need!